. 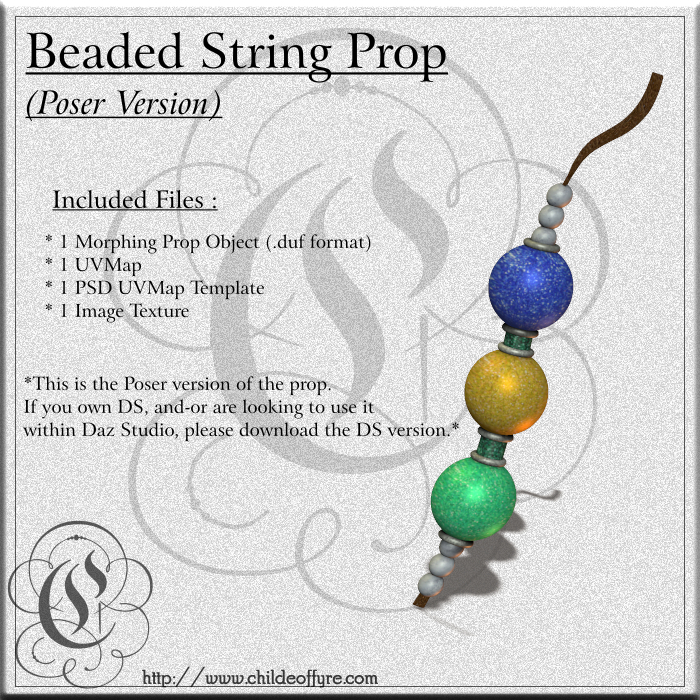 :: Beaded String Prop for Poser ::. This is just a very simple little beaded string type of prop. I made it to use on one of my character concepts, and have found a lot of other uses for it since. It can be hung on hair objects, bracelets, belts, buckles, bags, whatever you wish. It does require manual placement, so make use of the translation, scale, and rotation dials. For ease of use, and so you can find it, it loads in the center, on the floor, and at about 25% scale. You will need to rescale according to what you're doing with it. The beads do come with some basic movement morphs, mostly for moving the string. I very STRONGLY reccommend that you go lightly on the morph dials. Turning the dials up over, or under, 1.000 will do some very not-nice things to the shape of the string and the beads. UVs have been included for those of you who wish to make your own textures.